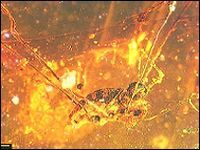 A spider relative called a harvestman trapped in amber could shed light on how arachnids were affected by the extinction that wiped out dinosaurs. The 100-million-year-old arachnid, which looks like it might have died last year, wandered though a dinosaur-dominated world. Though older fossils exist, hardly any are known from the Mesozoic Era (245 million-65 million years ago). "If you go back to the period of about 300 to 400 million years ago, you actually have more arachnid fossils. 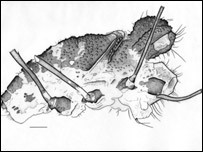 So the fact that we have any harvestmen from this time period is really quite unusual." Details appear in Proceedings of the Royal Society B journal. "This specimen came from the Mesozoic Era, so basically the same time as the dinosaurs and generally there are very few fossil arachnids from this period," said co-author Jason Dunlop, from Museum für Naturkunde in Berlin, Germany. One of the reasons this specimen is causing excitement is that it might help tackle the question of how many arachnid groups managed to survive the great extinction of around 65m years ago. If a fossil from the Mesozoic Era belongs to a family that existed in more modern times, its lineage must have made it through the extinction. Although this particular harvestman cannot be included in modern groups, it is pretty similar to later, post-extinction specimens. This could mean that its lineage survived the catastrophe - and if it did, then it is likely others did, too.